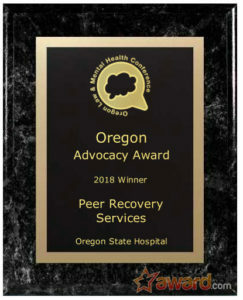 The Peer Recovery Services team of the Oregon State Hospital has won the annual Oregon Advocacy Award. The Peer Recovery Services team supports people at Oregon State Hospital through their lived experience with trauma, mental health and addiction challenges. Team members use a collaborative process based on each individual’s strengths, personal choice, and the sharing personal stories to empower peers on their journey toward wellness. “People diagnosed with mental illness share many experiences from navigating the mental health system to reclaiming one’s life. Members of the Oregon State Hospital’s Peer Recovery Services work hard to help patients get acclimated, get the most out of treatment, and get back to the community,” said Beckie Child, Interim Advisory Board Chair of the Oregon State Hospital Advisory Board. The Oregon Advocacy Award is given annually to a great advocate for people with mental illness and addiction in Oregon. The Award represents the perspective of persons represented by advocacy – persons who have experienced mental illness and addiction. The Award is given by the Mental Health Association of Portland in association with the annual Oregon Law & Mental Health Conference. The Award is announced prior to the annual conference, and is given at the conference. Oregon Advocacy Award – 2018 from Finding Films on Vimeo. Peer Recovery Services team from Oregon State Hospital really did a great job in their field. I’m so proud of you guys!